Long-only oil sector returned -26% since mid-June 2014. Andy Hall, Pierre Andurand gave-up on long-oil thesis in 2017. Boslego Risk Services offers long/short Model portfolio in Marketplace, supported by frequent analytical posts. 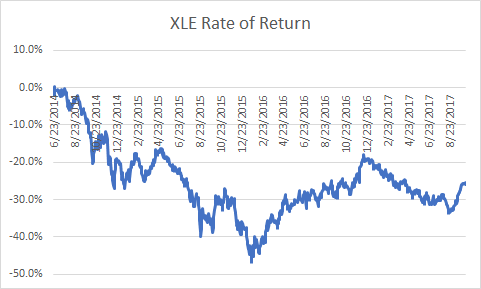 Since February 2017, Model portfolio > 50% return. Membership open for limited number of members. (Editors' Note: This article is meant as an introduction to Boslego Risk Services, a Marketplace service by Robert Boslego). Investing in the oil sector is fraught with risks (and provides opportunities) but has been particularly painful for long-only investors. A continuous, long-only position in the sector (XLE) has lost about 26% since mid-June 2014. Another high-profile oil fund, headed by Pierre Andurand, exited from its long oil position in early May, after it lost a reported 17% of its equity this year. I had also been highly critical of Mr. Andurand’s thesis (“Why Andurand’s Bull Oil Thesis Will Fail”). His 2017 loss offset his gain from 2016 and so the fund is profitless over the two years combined. 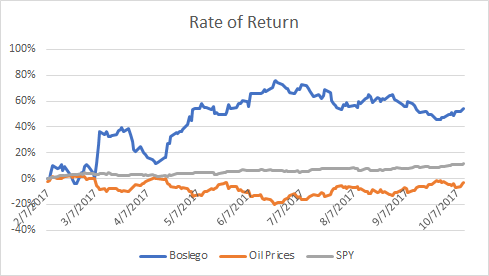 When it comes to oil investing, history proves that the “one-trick pony” strategy of being long-only is ineffective for building equity (“Why It’s Foolish to Be Bullish (All the Time) in Oil"). Changing long oil stock allocations before or during a market collapse is tantamount to re-arranging the deck chairs on the Titantic. The mindset of being a “long-term investor” is simply a poor excuse for piling-up losses from which it is difficult to recover. The risk/reward is asymmetric: a 50% gain is required to recover from a 33% loss. 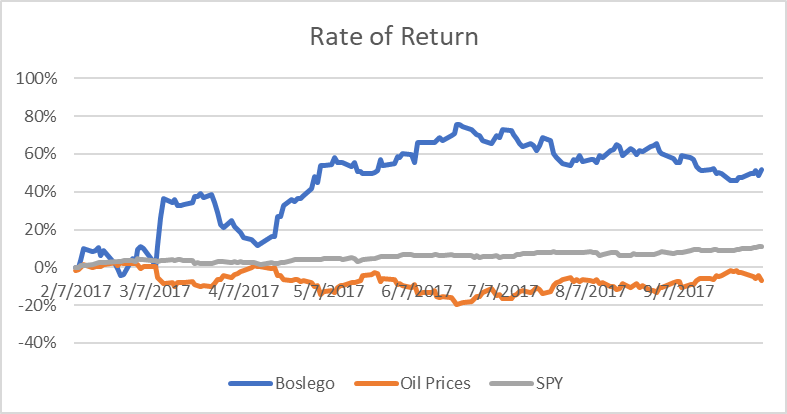 To guide investors who are interested in profiting from outstanding opportunities in the energy sector, I introduced a new service on Seeking Alpha’s Marketplace oriented toward individual investors, Boslego Risk Services. I provide a long/short Model portfolio which is continuously updated, along with on-going analysis of the oil market. The service has evolved since its commencement in the spring, as I exchanged ideas with members as to what would be most valuable to them. For example, members asked me to post updates to the Model portfolio as soon as I made the trades. A few years ago, I decided I would like to assist individual investors to help level the playing field. I have found this to be personally rewarding :). My members on Boslego Risk Services are a wide range of individual investors, from novices to professionals. There is also a live chat window in Marketplace, wherein members can exchange ideas and ask questions, and I can instantly respond. I also post links to articles that I find useful together with my take on it, and this helps members filter through the noise in the media. Since inception of the Model portfolio in early February, my return exceeds 50%. This compares to a 3% loss for a continuous, long-only oil futures strategy and an 11% gain of a long-only stock market portfolio (i.e., SPY). The strategy is primarily oil, using ETFs, instead of futures contracts, because ETFs are more accessible to most individual investors who do not want to manage margin calls. And I have added two other strategies that may select non-oil stocks. I call them my “Breakout” and “Breakdown” strategies. I found over the years that extraordinary profit opportunities exist when prices enter a break to the upside, or break to the downside. I have devised a process for identifying such opportunities, which I fully describe to members in a write-up in my service. Notes: Initial Model portfolio balance was $100,000. Daily returns include both realized and unrealized gains and losses. I am now accepting new members to Boslego Risk Services and invite you to sign-up. There are monthly and annual pricing options as described here. You may also read reviews posted by members here. The oil market provides highly profitable opportunities. Join Boslego Risk Services today and learn how to exploit them!